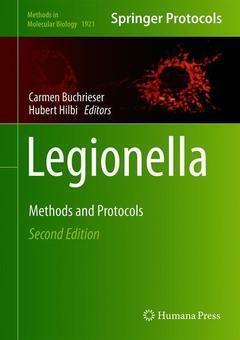 The methods described in the second edition on Legionella are for the study of distinct features of L. pneumophila. Chapters guide readers through ecology and physiology of legionella, legionella genetics, cellular microbiology of legionella, biochemical assays to study legionella effectors and enzymes, immunity and host response against legionella, metagenomics, proteomics, and host microbiomes of legionella. Written in the highly successful Methods in Molecular Biology series format, chapters include introductions to their respective topics, lists of the necessary materials and reagents, step-by-step, readily reproducible laboratory protocols, and tips on troubleshooting and avoiding known pitfalls. Authoritative and cutting-edge, Legionella: Methods and Protocols, Second Edition aims to be useful for scientists studying Legionella, and for a broader research community interested in the ecology, physiology, pathogenesis, immunity, genetics and evolution of other bacterial pathogens.